Sunny and Bluebird Skies, Water temperature 58* up and 63* mid lake. Today the guys wanted to fish a half day charter and take back enough fish for a dinner. They had rented a house on the lake and had their family's here on this pretty weekend. I got out early and caught bait then picked them up at their dock around 7. I say around 7 because the fog was SO thick I bounced from bank to bank trying to get to their house this morning. We went about a mile from their place and I saw a lot of action on my Simrad. I stopped and wanted to throw for some nice Gizzards but every time I would see the bait the Stripers were laced through out the bait. I put out a couple of downlines and looked on my trolling motor. I wanted to pull a shallow flat with boards so I put out a spread on the left side and started to set up the right side of the boat when rods started bowing over. After hooking up with 8 or 10 fish in about 10 minutes we took a quick break and situated some rods in the boat then went back after them. We popped about 15 more before the action petered out. I got back up on the big motor and located some pods of Stripers with the help from Anthony so I set up on them. We picked up where we left off earlier catching fish after fish. The only lull we had is when 8 or 10 boats ran over us and a bunch of fisherman moved in on us but we hung in there and banged the fish. We saw one other guy catch only 1 fish then Tony came over and started hooking up with his clients. 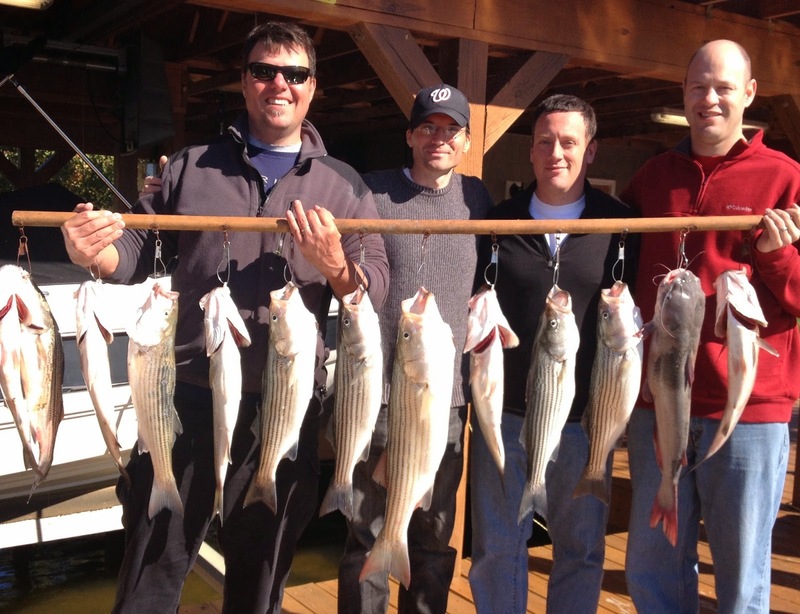 We had steady action this morning, probably catching close to 40 Stripers and 3 or 4 Catfish. The guys threw a lot of fish back today and ended up keeping more than they could eat this weekend.The fish will start to feed up now that the water is cooling off nicely and the action should pick up.